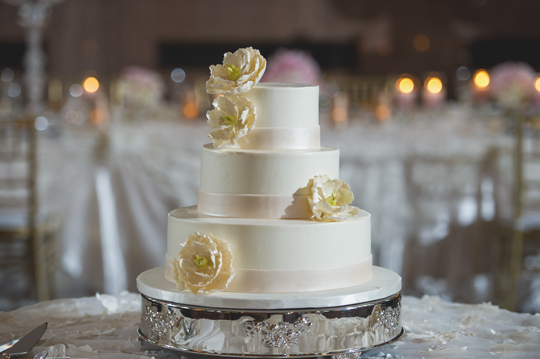 We often meet with couples looking for natural and monochromatic tones for their wedding cakes. This aesthetically pleasing, soft color palette generally consists of whites, ivories, creams, and champagnes. All of these tones are wonderfully popular for cakes, especially with the rise of vintage-inspired weddings. These two wedding cakes show the beauty of “natural” tones—one cake in its simplicity, the other in its intricacy. This wedding took place at the lovely Inn at St. John’s Grand Ballroom in Plymouth. Our bride and groom, Michelle and John, came to us for two reasons. First, they tried our hummingbird cake at a wedding show and fell in love with it. And secondly, they’d seen a picture of a cake that we had made a couple years ago and just had to have it. The crazy thing is, they didn’t need a very large cake as they were having other desserts as well. But they wanted it. And it’s good to feel wanted, right? We did make some adjustments to the design of course, to make it more their own. We changed the color of the fondant ribbon to a shiny, creamy blush. And we changed the flowers from white camellias to deep ivory peonies. The cake itself was iced in our white vanilla swiss buttercream and most definitely served that hummingbird cake! Held at the unique Henry Ford Museum in Dearborn, this wedding was pure vintage style. All the way from the bride’s lacy and feathery dress to the antique table for the cake. 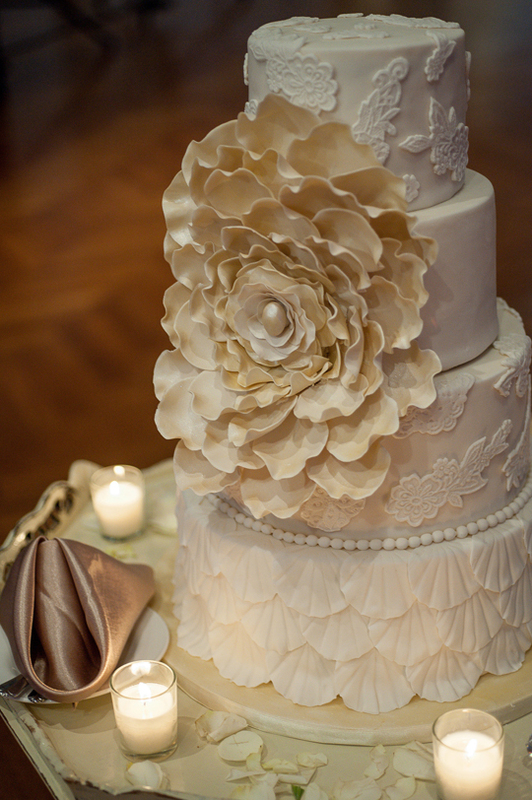 In this ivory-toned cake, the ruffled, scalloped edges symbolically mimicked the feathered bottom of the bride’s dress. Two of the tiers above were then highlighted with lace mold cutouts. The finishing touch was a large champagne-lustered fantasy flower with a pearl center. Surrounded by glowing tea light candles, this cake was just as delicious as it looked—and might we add, also served hummingbird cake. We loved all of our natural beauties—cakes and couples. Thank you for letting us share in your momentous day. Thank you to Rachel Shomsky and Tammy LaBar for the beautiful photographs!